My husband and I used to hang out in Korean town, 34th Street, NY before we had kids. It was close to his work and also, where I had my early intervention training (when I was training to be an Early Intervention Service Coordinator). We used to be able to do our holiday shopping around there and there was always lots to do and explore. There were Korean restaurants galore and I remember having my first taste of Beansprout Soup for the first time and I was immediately drawn to how it reminded me of Spring and how refreshing it was; it can be equally enjoyed hot or cold. 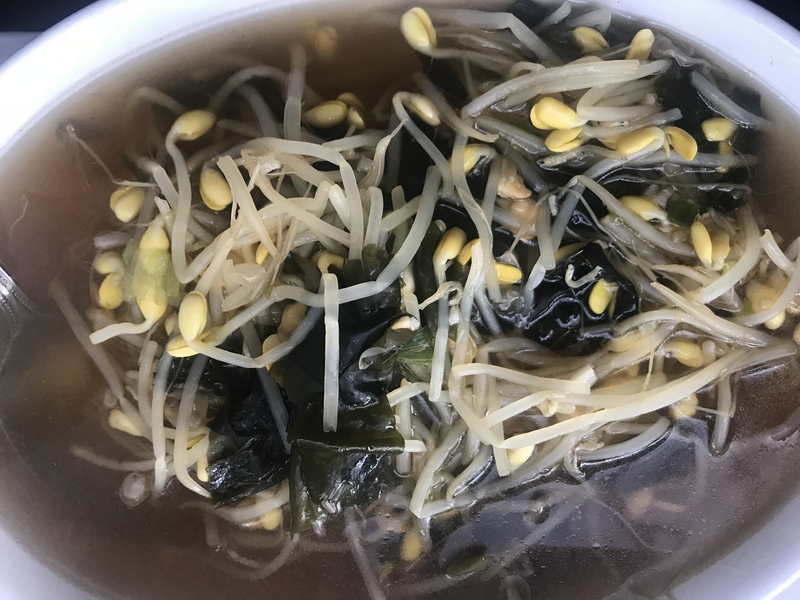 Beansprout soup, like Miso Soup, I love to make for the girls for either breakfast or dinner during school days. It’s nutritious and loaded with beansprout, garlic, scallions, and dried sardines. I’ve never added shrimp, but I could imagine the Unami flavor that shrimp (or even chicken) would impart. I think I’ll do that next time I make it because now I’m just wondering why I’ve never done it before. 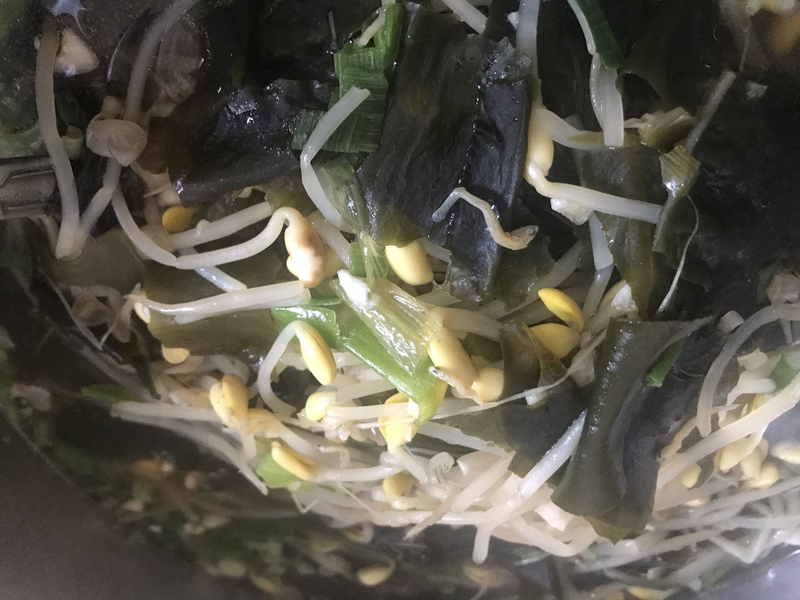 I cut up the beansprout and Wakame for the kids usually because they are both rather long before I serve it to them. They love this so much and the gobble up rice so quickly with this. It covers their daily vegetable intake for sure because I’m not exactly sure how much veggies they are served or choose to eat at school! After a long day at school, often eating salty and dried foods, having this for dinner I feel helps balance whatever they had at school all day. If you’re children are not allergic to eggs, it’d be a great addition to pour scrambled egg to it too. I love how versatile the soup is and how if you can easily control the salt in this if you are watching your salt intake. When I had my borderline high blood pressure period just last year, I had this soup without any salt and still enjoyed it very much! At sit down Korean Restaurants, we would often be served banchan (side dish) galore! It is one of my favorite parts of eating at a Korean Restaurant with so much to discover and every restaurant serve slightly different things. Sometimes it’s cabbage kimchee, sardines or marinated peanuts; other times, I’ve had potato salad, daikon kimchee and taro. I can’t remember them all, by there would always be at least 4-8 different items. It’s a grand experience to be able to taste the flavors itself before deciding what to pair them with when the main dish(es ) arrived. if you are bored one day or in the mood for exploring, I highly recommend checking out some Korean Restaurants to experience this delightful exploration. My husband and I are also obsessed with Barley tea, after having it once at a restaurant. It’s like a tea, that almost reminds me of a light vegetable broth because it’s so earthy and almost mushroomy in some ways. 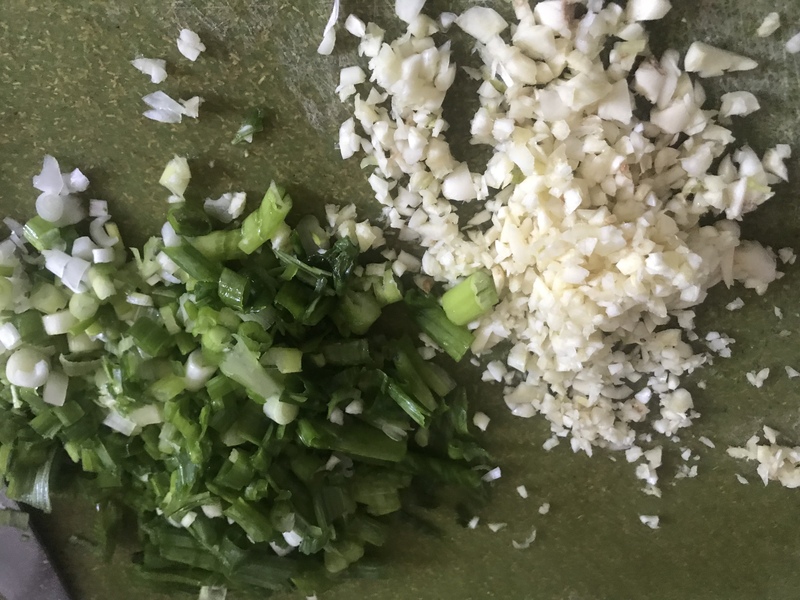 I start both dishes of with the minced garlic and scallion. The other ingredients I had are also the same, just in different proportions. 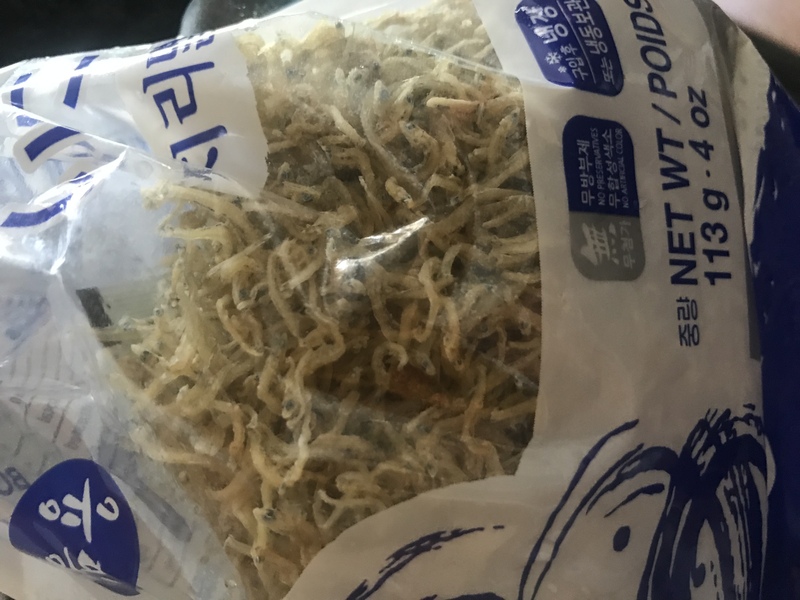 We purchased a 5lb bag from Hmart the other day and we shared with family about 1/3 of it. Bleached the beansprouts with ice and it did really well to help maintain the beansprout’s texture and crunch. Be sure to strain it well to prevent soggy Beansprout side dish. Look at all that beansprout goodness! Beansprout side dish, all done! The dried sardines I keep in the fridge. Inside it for the soup base. 1-Boil 8-12 cups of water. 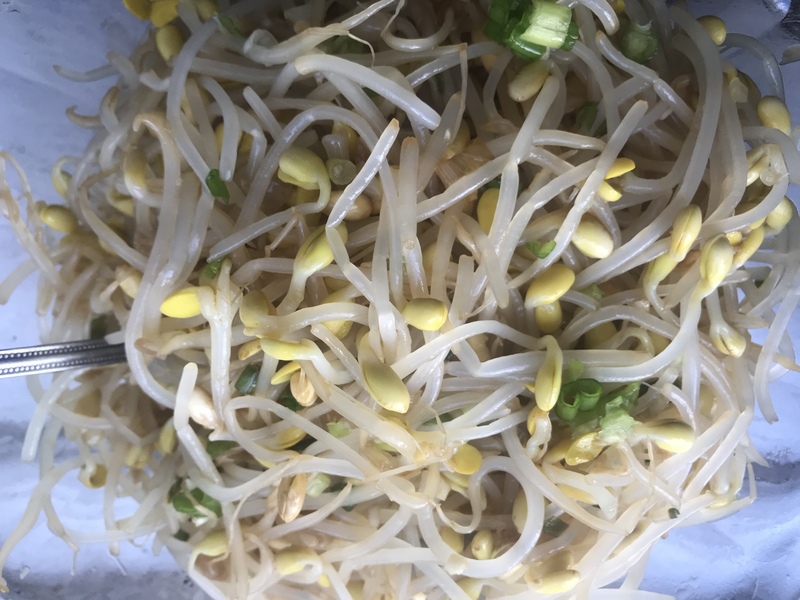 2- Add beansprouts to blanch quickly (shouldn’t take more than 2 minutes). You literally dump it in and take it out quickly (before it comes back to a boil) to put in an ice bath for a few minutes. 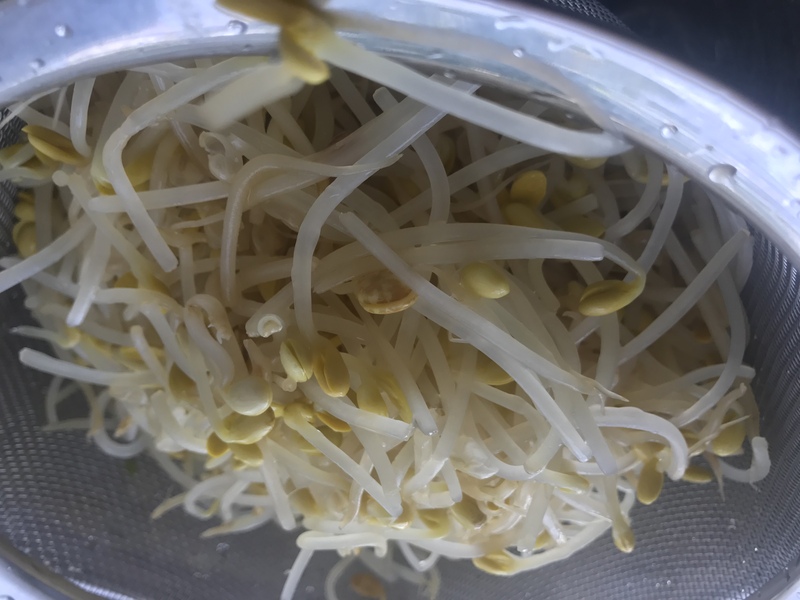 3- Drain beansprouts in a colander and set aside for about 5 minutes to finish draining. 4-Mix the rest of the ingredients in a large bowl ( it should fit all your beansprouts). 5- Toss in your cooled down beansprouts and gently mix to coat evenly in the sauce. 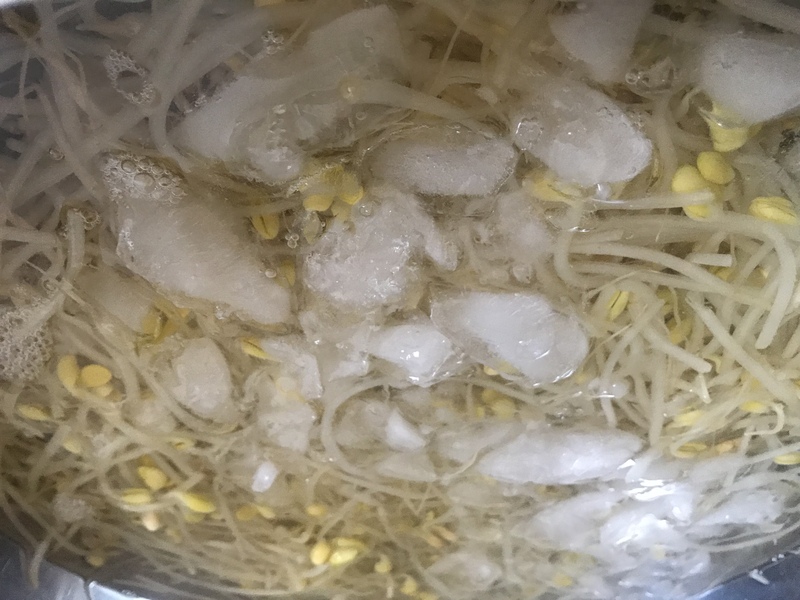 *Note: If you overcook the beansprout or you’re afraid it might go bad (they tend to go bad easily in my experience), just turn it into soup (recipe below) and it seemed to last longer for me that way. 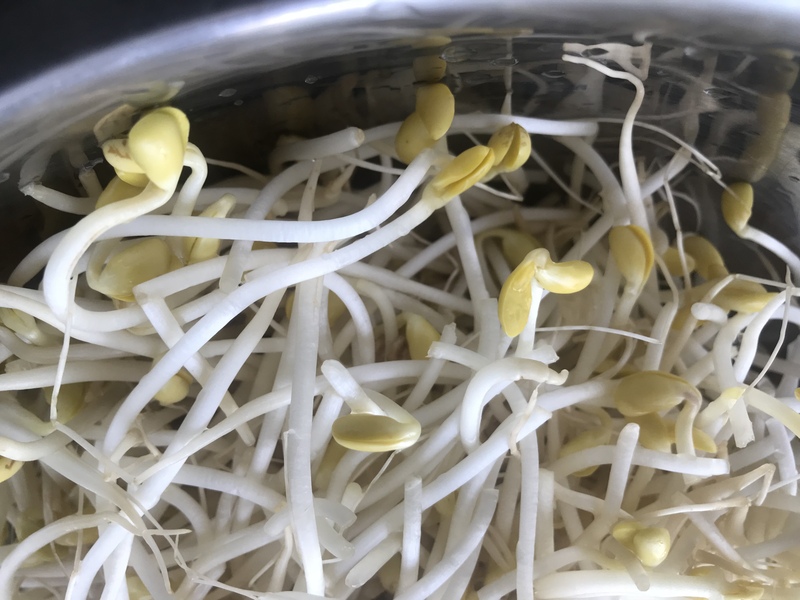 If there is a secret on how to store beansprout side for longer periods of time, please share it with us below! I don’t believe I ever made and stored it successfully for more than 1 days without going bad. 1- Use the water from the blanched beansprouts and bring back to a boil. 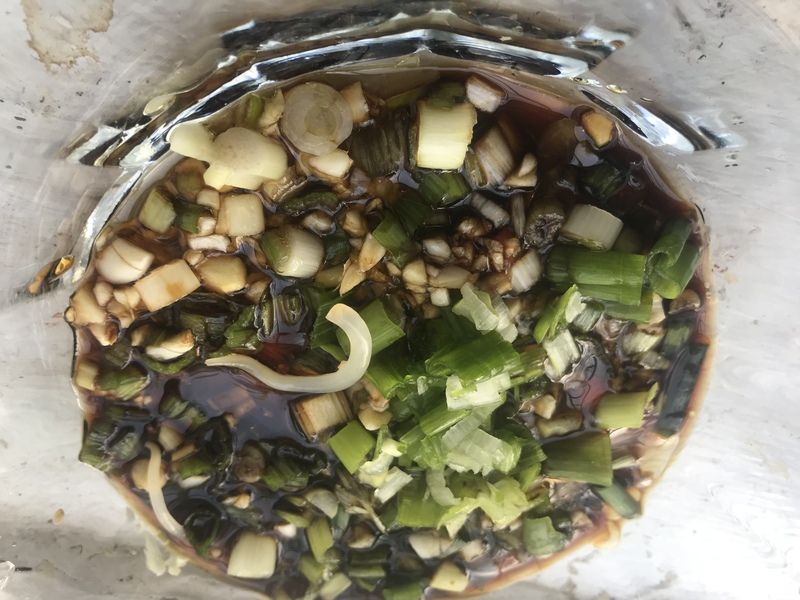 2- Add beansprouts and the rest of the ingredients into the soup, except seaweed and scallion. 3- Let the soup simmer on medium low for about 15-25 minutes. I’ve done both 15 and 30 minutes in the past and it’s excellent either way. I guess it makes sense though, that the beansprout soup flavor will be more concentrated, the longer you cook it. 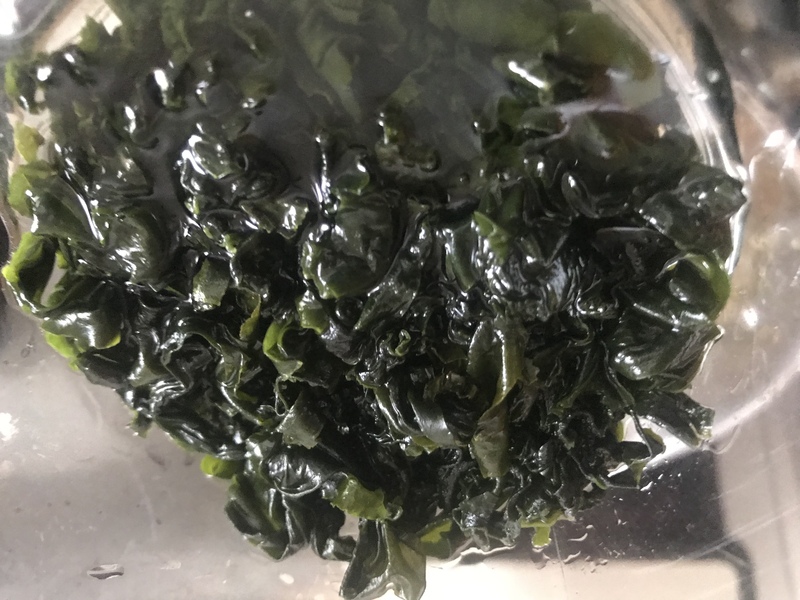 4- Add in the Wakame and scallions and summer for another 3-5 minutes. 5- I add more red pepper powder to taste or the Japanese red pepper flakes are even more amazing in this soup because there usually a blend of seaweed and sesame with their hot pepper flakes-and MSG I believe). 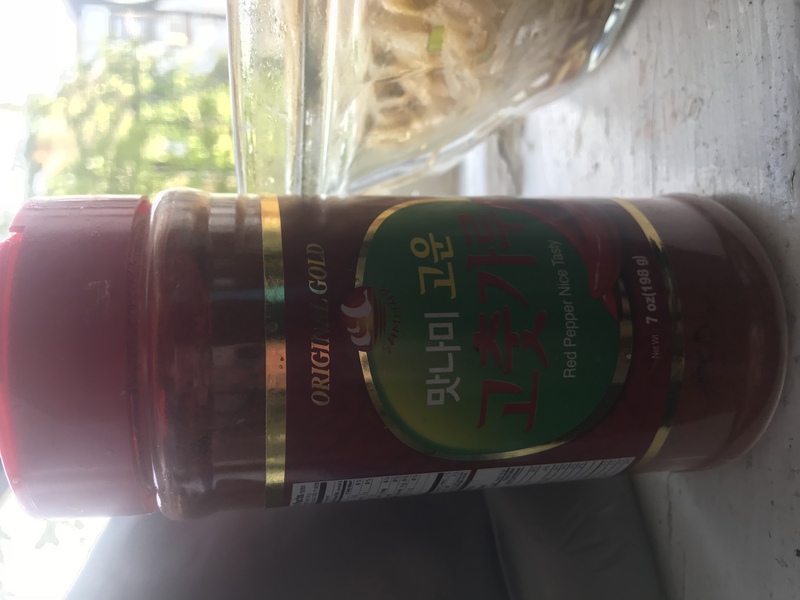 *Note: If you are feeding kids who don’t like spicy at all, you may want to omit the red pepper flakes altogether or add it at the end to taste. I think the red pepper powder is a large part of this soup because it has a great peppery, slightly smoky flavor that brightens up this mildly flavored beansprout soup. 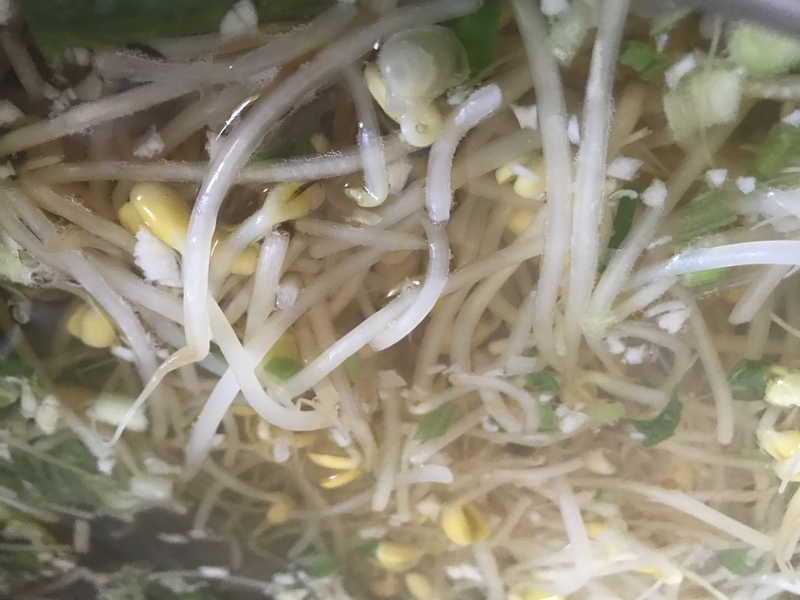 Have you ever had Beansprout Soup before? My family and everyone I’ve made it for seem to love it. What are your thoughts on this soup? 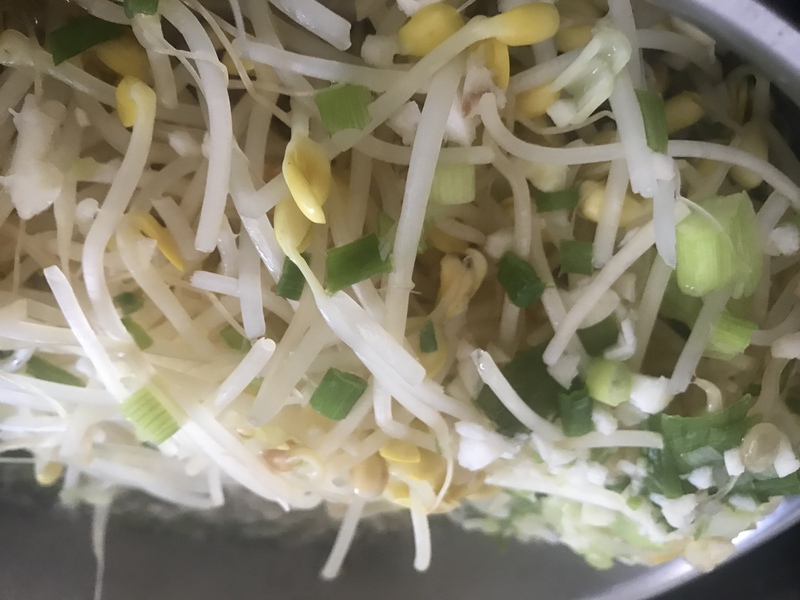 Please tell me I’m not the only beansprout soup fanatic!